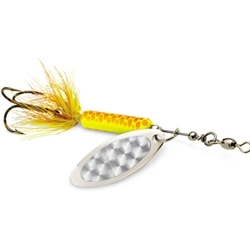 The Luhr Jensen Bang Tail is an In-Line Weighted Casting Spinner. The Bang Tail features a Built-In Swivel and an Instant-Spin Blade. The Hackle is attached to the shaft rather than the hook for increased durability.